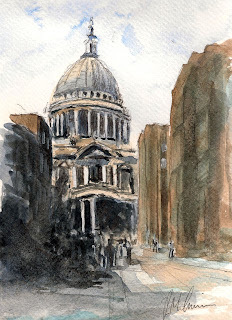 This small painting of St Pauls Cathederal in London was drawn using the new version of SimmTrace™. It only took 15 minutes. I can reveal more in a few weeks. I used mainly the 2 colour technique already shown on the leaves and Taj Mahal example. I have also added some cobalt blue, for variation in the shadows. I enjoyed your videos very much. I also discovered this "less colour is more" technique but painting digitally. Keep it up the good work ! Thank you for your kind comment CLaudio!